I am obsessed with autumn. I can't quite explain my obsession for autumn, maybe it is the crisp air or the falling leaves or maybe it is the fashion. Actually yes, I think that plays a huge part in my obsession, I love autumn fashion, I love the layers, the colours, the textures, the big cosy jumpers and the ankle boots. Autumn is that period of time before the freezing cold, snowy and hurricane-like winter, it is not so cold that you need to have thigh high boots and thermals, but it is not SO warm, you can leave your house without a jacket. Autumn is the perfect opportunity to work with your style, to find your style, adding layers, wearing hats and scarves as accessories rather than necessities. When it comes to autumn I like to wear big cosy knits, jackets that aren't quite thick enough for snowy weather, but not too thin I may as well not be wearing one and most of all I adore the deep moody burgundy shades. Typically I wear a lot of blacks all year round, but I am trying to get out of this habit, I want to add more colour to my wardrobe and play around with different shades, but black is a main colour for autumn. When you think of autumn you see imagery of Halloween, pumpkins, vampy shades, autumn is very much a dark, moody and vampy season and this means black is front and centre in this wishlist. So I recently rewatched Gossip Girl and I think I may have taken a page out of Queen B's book with 1 and 12. 1 particularly is very Blair, I can imagine she would pair it with a little blouse similar to the one in the photo or a lovely little floral day dress. To me, it definitely looks like one of those coats that you could wear in autumn because it isn't too heavy, yet if you layered correctly it could totally make its way into your winter wardrobe too. For 12 I wanted to add a skirt to the mix, I like wearing skirts in autumn with some tights and this one looked like a lovely thick cotton material, so it is cosy and with some cosy tights underneath it could be wearable in autumn especially with the deep shades incorporated into the checkered pattern. 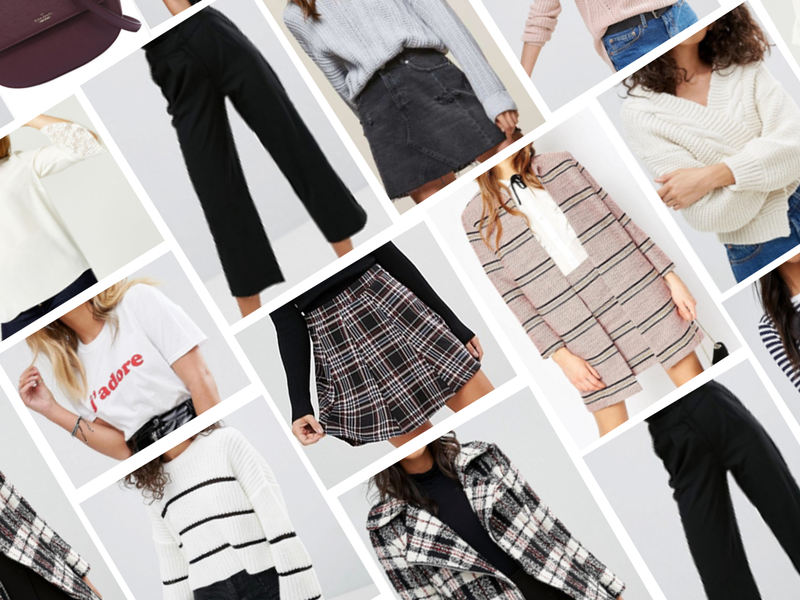 Of course, I had to add a lot of woollen jumpers into the mix in an autumn wishlist, aren't woollen jumpers the definition of autumn? 2, 3, 6 and 11 are all gorgeous woolly jumpers I couldn't not add into the mix. I love to layer with woollen jumpers, they are perfect for looking fashionable while still being roasty toasty. 2 is a very unique style, it has quite oversized sleeves which I love, it adds a little more definition to a traditional jumper while 6 and 11 are traditional grampa knit jumpers but the pastel shades add a little more colour to the traditional vampy autumn colour palette. I have been on the lookout for a cosy knit cardigan so I can still wear fancy blouses underneath, so I totally fell in love with 3 as it is a cropped cosy, knit cardigan that would look gorgeous with a blouse underneath. If you follow me on Instagram you will know I am totally loving and zoning into the whole Parisian, French theme at the moment. I am a sucker for anything stripy and so I loved 8 as soon as I saw it, it's a pretty basic piece but the three quarter length arms means it can keep you cosy while making you look super stylish. When it comes to 5 I just think a slogan tee is something everyone should own and I thought it was adorable that this one says 'J'adore' on it opposed to a Love Island (my eyes rolled too) quote which is all I seem to be seeing lately. Like I said black is a main colour for autumn because it gives off the vampy, dark autumn feel, but it's even better when paired with white. 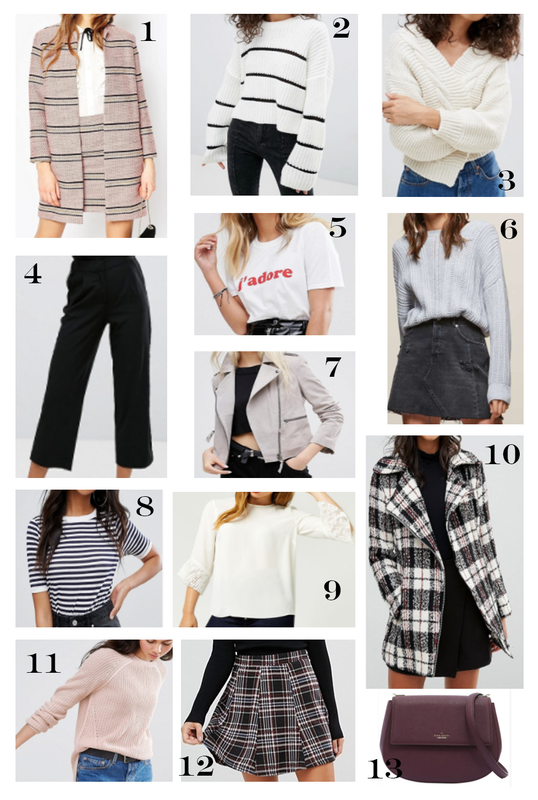 I have never tried culottes myself, I always think they look so chic on others, but I always thought I was too short for them, but I am up for giving them a go this autumn with number 4. I also think they would work perfectly when paired with 9, a lovely little cotton jumper with lace sleeves. It is a very normal piece, but the lace detailing make it stand out from the crowd and look a little more put together, which is exactly why I fell in love with it. Of course, I had to add in a heavier coat just in case the weather got really bad this autumn and that is exactly what 10 is, a gorgeous heavier coat and the black and white checked pattern make it perfect for autumn and winter. What pieces are you loving? Are you excited for autumn fashion or holding on to summer? Tell me below in the comments.